This brain dump was written with love for a presentation at the Tennessee Higher Ed Tech Symposium 2017 and an internally talk for the fine folks I work with. Technology is constantly evolving and changing so it’s easy to dismiss hype as “new hotness.” I must hear “There’ll be a new thing in 6 months” on a monthly basis from skeptics. And they aren’t necessarily wrong. While that may be true, it’s probably irresponsible for a web developer to deny the significance of our current iteration of changing web technology that’s being driven by the ubiquity and prevalence of mobile tech and cloud computing. Over the past 10 years or so, the surge in mobile web access has brought a lot of new challenges to web development that we’re still trying to figure out and they aren’t novel or trivial. For example, to meet the challenge of displaying content on an infinite number of screen sizes responsive web design and mobile first web design emerged as the accepted ideal approach to that problem. It’s hard to believe those terms are barely five years old. It’s worth noting that Redux can be considered to be an implementation of the Flux architecture recommended by Facebook for use with react apps. I hope that if you get anything out of this today it’s that these tools encapsulate paradigms that transcend “new hotness” or JS framework of the week burnout. When a company like Facebook makes their secret sauce public, I believe it’s incumbent upon a good developer to pay attention if only to understand the patterns used and the problems that a company like Facebook is currently trying to solve. The problem Domain I want to focus on that react and Redux aim to solve relates to state management in client side web applications. More specifically, the tendency web developers have fragment the source of truth of our state often relying too heavily on the DOM to contain and keep track of state rather than just present it. It sounds like the DOM is at the core of this issue. So what’s the DOM? When we go to a webpage, what we see is ultimately determined by an underlying html document that’s sent to the browser from a web server. But when we interact with that page in a browser, we’re actually interacting with the DOM. Right click and view source on any page to see the underlying html document that was returned in the response – it can’t be changed without a new request to the server. Right click and inspect an element on a page to see an html-like representation of the the rendered DOM in your browser’s dev tools. Here we can see that we can manipulate the DOM by simply clicking on elements and deleting them in dev tools, editing nodes as html, or typing JS directly in the console. (I actually do this often to delete annoying registration modals that pop up on news sites before you can read the article.) 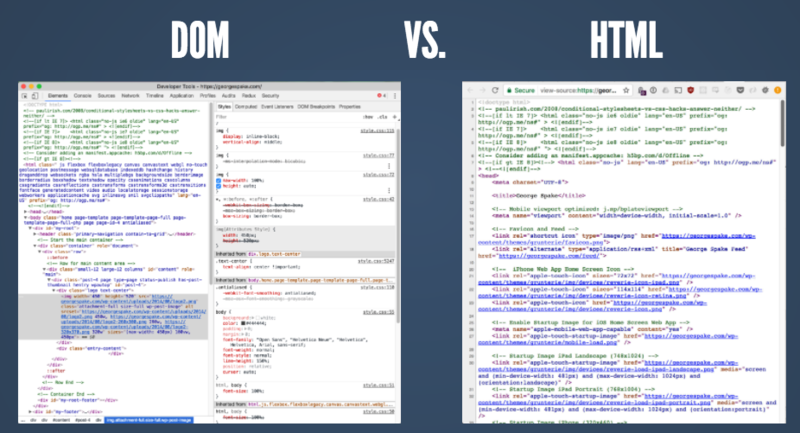 With a general understanding of how the DOM differs from the html document it’s based on established, I want to shift back to JS for a moment. We have to talk about JS because, for now, it’s the language we use to manipulate the DOM. In the future Web Assembly could change that but that’s another talk. 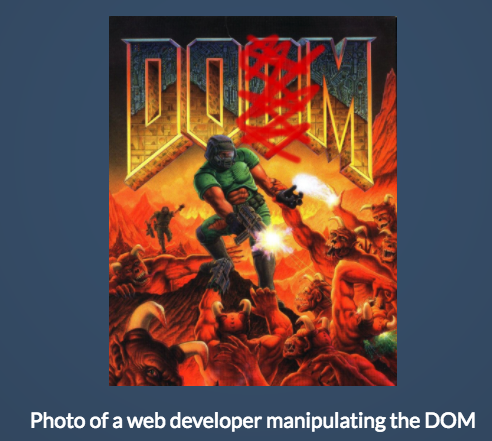 For now DOM manipulation is monopolized by JS. JS – which is spec’d to ECMA Script – has not done the best job of evolving despite its prevalence and ubiquity – I’ll spare you the history of JS but just know that it was born in 1997, famously written in 10 days and from version 3 published in 1999, it would be another 10 years before ES5 would be published (version 4 was abandoned). Doug Crockford has cited this API for interacting with the DOM as one of the worst APIs ever created and points out that, unfortunately, this is the experience most people have with JS; they think they hate JS when what they really hate is the DOM API. 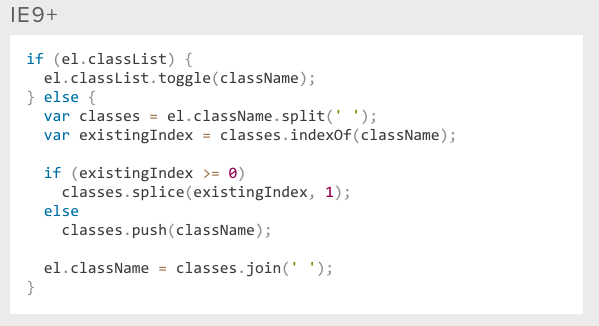 Consider the code needed to toggle a class in plain ol’ JS. In 2006 jquery came along and added some cool features APIs and syntactic sugar on top of this awful API to empower web developers to manipulate the DOM more easily. Consider the same toggle-class example in jQuery. So that’s great right? Well, yeah. That’s how the API itself should look. Anytime normal people can wield powerful tools to get stuff done, that’s awesome. It’s a gift and a curse, though. Often, when things are easy, they open the door to bad practice, bad patterns, bad code, and bugs… when you hear people hate on JS and jQuery – a lot of times it’s because they’ve come into contact with blasphemous atrocious code that somebody was able to throw together without really knowing too much about how to write good code. The technical debt from this sort of thing comes due when it has to be maintained or reused and something goes wrong. In 2015 Ecmascript 6 (ES6, ES2015) was published with a plan for regular updates in the future. It came with a lot of new features and syntax that JS developers have been clamoring for for years. Meanwhile, a lot of functional programming paradigms have really started to take hold and for the first time in a while, it’s actually cool to write plain JS. As an aside, there is a caveat – Ecmascript, the spec, is moving fast – faster than browsers – so in order to be able to use all these cool new features and have them work, they have to be polyfilled – which is typically handled by babel and Webpack – babel transpiles or polyfills our esnext JS to ES5 and Webpack bundles up nice clean minified and optimized assets for the browser. I expect this won’t change anytime soon. The reality is browser support is just too sketchy to rely on so, for the time being at least, Webpack and Babel will be a requirement for writing modern JS. The tooling is good and getting better, though, and tools like create-react-app hide a lot of the complexity making it easy to get started, so it’s becoming less of a source of frustration. The concept of state is both simple and difficult to articulate. It can be described as nothing more than a snapshot of your application at a given time and could include things like characters typed in a search field, the results that are displayed on the page from that search, selected items etc. We rely heavily on the DOM to contain and modify our state but we shouldn’t because, as we’ve seen, the DOM can be manipulated from every direction, it’s just not reliable, and entire classes of bugs exist in this area. The DOM should have one job which is representing the state of our app and telling a more responsible party if some event happened so it can decide what to do with the event. I like to think of the DOM as a playpen full of irresponsible toddlers. They shouldn’t be given any responsibility to dress themselves or make decisions – the parent puts their clothes on and changes their diapers and they just wear them and cry if something happens at which point the parent decides what action needs to be taken. The DOM should only be concerned with representing your state. Here’s an example of a UI project I inherited. The researcher who wrote this managed to get pretty far but it’s a great example of relying on the DOM to track state and handle actions unsupervised. Users use this interface to build custom queries to extract DNA sequences based on some criteria. When the query is submitted, the app uses jQuery to look at all of the elements in one DOM node to get the cohort data, then looks at an element in another DOM node to get the genes, then it puts them all in an object. and collects them and sends them off to the server. The first problem here is that the DOM has been given the responsibility of being the source of truth of the app’s state. The second and equally concerning problem is that my app’s state is fragmented. There’s no single source of truth for my app’s state. Some of it’s here, some of it’s there. It’s crazy. In reality, that’s what a lot of jQuery heavy web apps look like in reality because jQuery makes it easy to get in to this situations and there’s a lot of technical debt due as a result. That’s the problem. When we look at react, we can see that the problems it aims to solve – the concerns it aims to separate – are not related to trivial endeavors like separating HTML, CSS, and JS which are inherently coupled, or recreating an MVC architecture in the front-end – Facebook has prioritized bigger state-related problems like separating the management of state from the representation of state. React does this by breaking each part of the UI down into reusable components that are dumb – in that they aren’t reliant on or concerned with any state and the state just gets pumped in from somewhere up the tree via “props.” As we keep moving up the tree, eventually we should eventually get to a single source of truth for the state of the entire app that gets pumped down into the UI. We can be confident that react is smart about re-rendering the parts of the UI that represents state that has changed; so it’s not re-rendering a bunch of stuff all the time that hasn’t changed and it’s fast and performant. Essentially, we’ve taken our UI and pulled all of the state out of it and now we can understand that, in doing so, we now have the opportunity to handle changes to state sanely. Redux has become the go-to state management solution for React – although it’s not tied to React and can be used without React, they’re so complimentary that it’s hard to talk about one without the other. Despite its apparent complexity, Redux is actually pretty simple once you understand how it works but the paradigm it encapsulates triggered a paradigm shift for me and that’s why I would encourage everyone to learn it, even if you don’t expect to use it. Redux introduces a store which contains your application’s state in single immutable object also called the state tree. The state is updated by dispatching actions to pure functions called reducers that take the existing state and an action that describes the change and return a new state. The react app is subscribed to that store, the single source of truth. The state and actions are mapped to props for react and, whenever a new state is created the state is pumped down to the UI. If all this sounds like too much, I want to talk about where this starts to pay off. Now that I’ve rambled on for six pages, I have to mention that I’d be doing a disservice by attempting to teach anyone react or Redux. Instead, I’ll offer some suggestions about where to go to learn from much more qualified instructors. Redux author Dan Abramov himself has an exceptional two hour free course on egghead called Getting Started with Redux that, in addition to React, Redux, and JSX, covers ES6 syntax, test driven development, and pure functional programming concepts. Netflix developer Brian Holt has a twelve hour workshop on Frontend Masters in which he walks through building a Netflix client with React and Redux and React Router. He covers server side rendering and implementing search. It’s not a trivial app so you get to see what a real app might end up looking like. This is also available on github in written form. A Guide For Building A React Redux CRUD App by rajaraodv demonstrates some best practice patterns for code organization and handling requests in a CRUD app client that consumes an API.